Herb Robert plant, Geranium robertianum, is an attractive member of the geranium family with valued healing properties. This herb is a must in every garden. The infusion of the leaves is used to remove radiation from body. Consume hot as a tea and use cold as a foot infusion.Leaves may also be added to salads. Utilised as an eye wash. Herb Robert plant is native to Europe and Asia and prefers rich, moist and well composted soils, in a shaded or part shaded position. Readily self sows. Pretty pink-purple flowers. Drought sensitive, moderately frost tolerant. Annual or biennial growing to 0.3m x 0.4m. 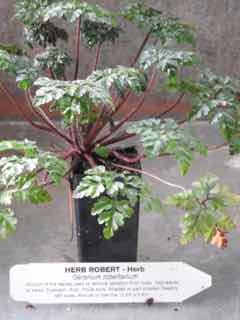 Be the first to review “Herb Robert, plant” Click here to cancel reply.